The Chandlery Yacht Sales brokerage has been helping people buy new or used sailboats for 70+ years. For you, that means you are working with people who truly love all things sailing. The Chandlery crew delights in helping people find just the right boat for their needs and dreams. 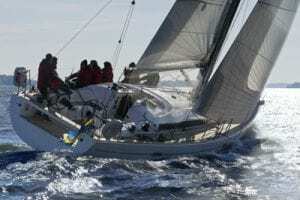 Buying a used sailboat is best done with the help of experienced yacht brokers like the team at Chandlery Yacht Sales. We understand sailboats and know what to look for. Perhaps you want to start racing or just want a family pleasure boat. We understand the difference and will guide you to the perfect sailboat to fit your needs. Below is a list of mostly used sailboats we represent. Naturally, our longevity in the business means we know about lots of other boats, many that might not be listed. When you find the perfect used sailboat, our team will guide you through the process from beginning to end. We will be there to view the boat, look at her with sharp eyes letting you know her pluses and minuses. Handle all negotiations in a professional manner. Coordinate commissioning, rigging, electronics installation, and haul-outs. We have extensive knowledge and decades of experience. Allow our family to help your family find the perfect boat.